Fifteen Hudson Yards in New York has revealed its 3716 m2 (40,000 sf) of lifestyle and wellness amenities. 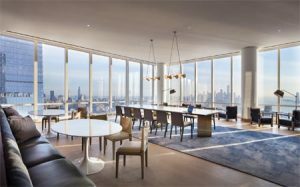 Hudson Yards has provided a sneak peek into Fifteen Hudson Yards in New York City. It has been designed by Diller Scofidio + Renfro and Rockwell Group. Spaces on display include high-floor wellness and entertainment amenities with 360 degree views and two model residences on the 25th floor. “As we approach the grand opening of Hudson Yards in March, we are thrilled to offer a first look of what it will be like to live at Fifteen Hudson Yards,” said Sherry Tobak, senior vice president of sales at Related Companies. There is 3716 m2 (40,000 sf) of amenities at Fifteen Hudson Yards. The 50th floor is for wellness and the 51st floor is meant for entertaining, leisure, and cultural pursuits. New York-based interior designer Elena Frampton curated Residence 25H, one of the model spaces on display. It is a 206-m2 (2221-sf), three-bedroom, three-bathroom home. Frampton hand-selected bold wallcoverings and vivid structural furniture inspired by Fifteen Hudson Yard’s architecture. The other residence on display (25G) is designed and styled by Neiman Marcus fashion director Ken Downing. Downing paired colors from the runway with a diverse selection of art and vibrant furniture textures to enhance the 136-m2 (1464-sf) space.